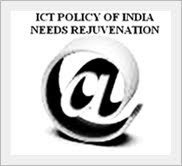 Information and communication (ICT) related policy matters are always ignored in India. Experts have been advocating for the rejuvenation of ICT polices and strategies in India. However, despite all glamour and big fuss, nothing concrete and substantial has been achieved in India. The fact is that e-infrastructure and e-governance in India are in really bad shape. The role of Indian department of information technology (DIT) and Indian department of telecommunications (DOT) is far from satisfactory. Till now India does not have an “ICT Vision”. All Indian decisions regarding ICT are ignorant, half hearted, corruption laden, transparency lacking and retrograde in nature. Whether it is lawmaking or policy formulation, ICT is an ignored field. Indian government is least bothered to rectify this position and Parliament of India seldom interferes in this process. Further, in matters of cyber law, cyber security, cyber forensics, judicial training, law enforcement training, etc there is a complete failure in India. For instance, India has cyber criminal friendly and impotent cyber law, meager cyber security and cyber forensics capabilities, excessive e-surveillance, absence of privacy and data protection laws, rampant corruption, absence of transparency and many more vices. We do not have an ICT Policy that can cater the requirements of these fields. All we have are thousands of unfulfilled promises by our ruling government where no action has been taken upon them since decades. It is high time for the government of India to formulate and implement good, effective and transparent ICT policies and strategies in India. DIT and DOT must at least now play some pro active role in this regard.